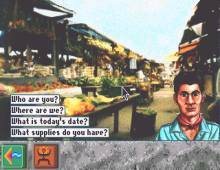 The Amazon Trail is a fun game in MECC's Trail series, of which The Oregon Trail is the best and most well-known game. MECC once again succeeds in combining education (in this case, facts about the Amazon rainforest and its inhabitants) with fun gameplay. Unfortunately, though, the game is too hard for all but the most patient of adventurers-- and definitely too hard for its target audience of 7-12 years old. As in other Trail games, your primary objective in The Amazon Trail is to explore and survive in the harsh environment. Your goal here is to travel down the Amazon, searching for gifts to bring to the Inca King. You will have to stop in many cities along the great river, in which you have to trade with the locals, to get items that you will need. You will have to take photographs of the natural life along the Amazon periodically. There are not many options, until you actually get someplace. Then you can trade with the locals, ask them for information, and decide where you are going to go next. When you are not stopped at an important location, you can keep sailing, go to the jungle for pictures, or fish in a difficult mini arcade game, full of obstacles such as logs, that will challenge even action game veterans. And if that's not frustrating enough, you can --and will-- die from a plethora of exotic diseases, often without knowing exactly why. Fortunately, the guide you choose early in the game provides a lot of helpful clues and advice-- too bad he/she can't help you with the mini arcade games. Overall, The Amazon Trail is much more difficult than other games in the series. It's also much more linear-- you won't feel compelled to replay it after you've found all the secrets for the Inca King. 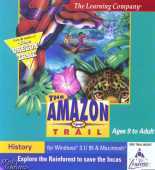 Still, even without the great replay value of The Oregon Trail, The Amazon Trail is a solid edutainment title that's well worth a look-- if only to finish it just once. You'll at least learn a lot about Amazon tribes, flora and fauna in the process.